In the UK, men are three times more likely to take their own lives than women. A startling statistic, one that desperately requires improvement. Mental illness is impacting too many people, some of whom feel they have nowhere to turn and nobody to talk too. Particularly in young men, the statistics around those suffering in silence are both shocking and significant. Mental illness doesn’t discriminate, it refuses to care for wealth, occupation or status but can affect anyone at any given time. In MFW’s latest interview, we caught up with former City player Cedric Anselin, who opens up about his struggles with depression, as well as reflecting on a career that involved playing with footballing icon Zinedine Zidane before arriving on British shores and playing in the Fine City. Cedric is now vocal about men’s mental health issues, hoping his stories can help those suffering in silence. As he sat across the desk and opened up on the illness that dented a promising career, it’s difficult to reflect on that chat without feeling emotive and reflective. The precociously talented Anselin had arrived on these shores after rising through Bordeaux’s academy. He couldn’t speak a word of English but wanted to embrace the challenge of moving abroad. ‘I was obviously a part of the first-team at Bordeaux but the manager changed and he told me I was part of his plans but then I wasn’t playing. As a player, you want to test yourself and to go to the next step, then my agent called me and said ‘are you prepared to go abroad’ and I said, why not? ‘At the start, Norwich City was not interested. I didn’t have any contact with Norwich, we had contact with Southampton and I went over there on trial for a week with a friendly in midweek. 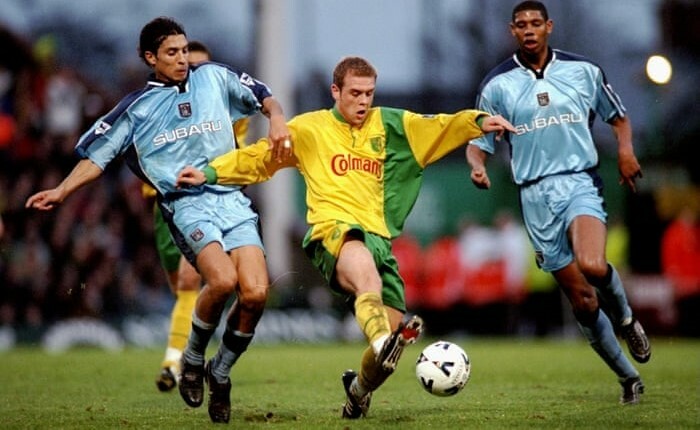 ‘It was destiny that I wasn’t due to sign for Southampton and I was due to sign for Norwich City. When I came back to Bordeaux from Southampton, my agent called me and said Norwich were looking for a player like me. He asked if he should organise a trial and I said yeah. His career was however beset by demons, which set him back. In 2012, he was ready to do something that had been lingering in his mind for months, even years. Four years earlier, Cedric had come close to taking his own life but had been saved by his wife. ‘I’ve had a lot of time to reflect on this, to be honest … I thought it probably began when I left Norwich but I can easily say my anxiety and depression started at a very young age. My mum was an alcoholic and my dad was very abusive mentally. When I actually got the call from Bordeaux it was like a golden ticket. ‘Because you are in that bubble world of football, you get people praising you and the word failure isn’t really ever involved. As someone who has had the honour of being coached by Cedric, his love for the game radiates out in his training sessions. As a coach, he is one of the most insightful I was privileged to learn from. He didn’t merely care about the footballer but he also cared about the person. ‘It got to the point where the journey to Colney was horrible. It was only a 20-minute journey but you feel that pain in your stomach, your hands feel sweaty and your head isn’t right. There’s a cloud above your head. You arrive in the car park and burst into tears in the car and you’re worried someone is going to see you. ‘When you walk into the dressing room, you place a mask on your face. A mask of protection and projection but five minutes before training or a game, you’re in the bathroom, being sick. That wasn’t only the butterflies in your stomach, in my mind I was not right. I was not well. ‘I didn’t want to go training, I wanted to be in bed, I wanted people to leave me alone but when you’re in the public eye you can’t do that. I didn’t have a manager who I could easily knock on the door and have a chat with him about that. It wasn’t like it is now. The full interview can be viewed here, on MyFootballWriter’s YouTube channel. If you require someone to talk to, then please don’t hesitate to contact the Samaritans. A huge thank you to Cedric Anselin for his insight, honesty and time, to Ben Ambrose – our producer, director and cameraman who is responsible for making these interviews watchable – and also to the guys at the Recruiting Office for providing us with a space to conduct this interview. being born in 1950 we were always told men don’t cry. and show you are a man neither of these really mean a lot these days. After joining the RAF it was instilled in you even more and if you look at military history on illness how long before bsttle fatigue was recognised and they are still trying to get to grips with PTSD. Connor this has been a very good read we all feel for Cedric and wish him all the best and hope all the help he needs he gets and the same goes for anyone suffering in silence. I grew up around ten years after Alex B (above) and can only agree with him. In the Police (even if you were only basically an upper-class civvy with some potentially dangerous physical duties like me) there was no room for what was perceived as weakness. You had to show out as hard when maybe underneath you weren’t. There was no concept of what Cedric speaks of being taken seriously in those days (1980-83) believe me. I had the privilege to meet Cedric once a few years back and I can assure you he was a terrific guy and his English was great! Great respect to him for highlighting a situation that is all too real. Potentially for each and every one of us.